Agatha Christie's Poirot: Collection 8 features four feature length murder mysteries starring David Suchet as the world famous Belgian private detective Hercule Poirot. In Murder on the Orient Express, Poirot’s journey on The Orient Express takes an unexpected turn for the worse when he is approached by ruthless American businessman Samuel Ratchett, who offers him $10,000 to protect him from his fellow passengers onboard. Poirot awakes the following morning to find the train stuck in a snowdrift and Ratchett dead in his compartment. Interviewing the varied passengers, Poirot finds a proliferation of clues pointing in opposite directions. Realising the true identity of Samuel Ratchett, Poirot is not convinced that a mysterious assassin who got on and off the train is the killer. Isolated by the snow and with civilisation out of reach, Poirot is forced to make a decision that will change his life forever. In Three Act Tragedy, Poirot visits Cornwall to attend a dinner hosted by his friend, retired actor Sir Charles Cartwright. When an amiable local Reverend chokes to death on his cocktail Poirot realises that, with the exception of Sir Charles’s doctor friend Sir Bartholomew Strange and the enigmatic Miss Egg Lytton Gore, anyone of the eclectic guests could have taken the glass. When, weeks later, Sir Bartholomew Strange chokes to death surrounded by many of the same guests, the motives seem plentiful. Could a missing butler, a mysterious telephone message or secret tunnel be the key to solving the case? In the enigmatic The Clocks Lieutenant Colin Race is investigating the death of two Navy personnel when a distraught Sheila Webb runs out of 19 Wilbraham Crescent and into his arms. 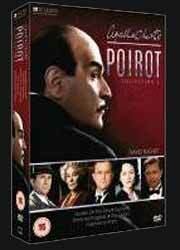 Poirot travels to Dover at Colin’s behest and observes the mounting complications to the case: there are four clocks frozen at the time of 4:13 in the room where the body was found; the owner of the house denies having requested Shelia’s secretarial services; there’s an unidentified murder victim and a host of neighbours with their own dark secrets. A wall of evidence begins to build against Sheila and the clock ticks for Poirot when another innocent victim is found brutally murdered. Award winning actress Zoë Wanamaker makes a welcome return as Ariadne Oliver in Hallowe’en Party. When Ariadne attends a children's Hallowe'en party in Woodleigh Common with her friend Judith, a young girl boasts of having witnessed a murder years before. Later that evening the girl, Joyce Reynolds, is found dead. At the request of Ariadne, Poirot arrives at Woodleigh Common to investigate the murder. While Poirot pieces together the facts, another child is found murdered. A forged codicil, a missing au pair and a secret love affair all serve as clues to solving the crime. For those that have been following Agatha Christie's Poirot on TV over the years this collection may seem a little confusing. The eighth series, as broadcast on TV, originally aired in 2001 and 2002 (and consisted of the feature length episodes Evil Under the Sun and Murder in Mesopotamia). The episodes as presented here are actually from series 12 which were originally broadcast between January 2010 and, at the time of writing (the beginning of January 2011) one episode (The Clocks) is still to be broadcast. The episodes included here are Murder on the Orient Express (originally broadcast 25 December 2010); Three Act Tragedy (03 January 2010); The Clocks (to be broadcast in 2011); and Hallowe'en Party (27 October 2010). Extras include a behind the scenes look on Murder at the Orient Express (14 min, 16 sec which includes interviews and footage from the set of that episode. The attention to detail on the train sets is pretty impressive); and David Suchet on the Orient Express (46 min, 59 sec documentary with the Poirot actor onboard the famous train. It's a fascinating documentary, but it's totally ruined one of my "must do" things. I was always keen to travel on The Orient Express, but after learning that there is no shower facility the thought of spending several days without a proper wash is a major sticking point. Suchet seems quite personable and politely laughs and jokes with passengers who make murder jokes as though it's the first time he's heard them, when he must be sick to death of them by now). This collection is yet another worthy addition to the Poirot stable of crime dramas.